Additional supporting evidence for the video contained in this earlier work from The Bands of Time YouTube Channel linked to this previous post "Eden Thou Was in the Garden of God"
Pishīn, town, Balochistān province, Pakistan. The present town, founded by the British as a military and civil station in 1883, is a market centre and has a noteworthy rest house with a fine garden. It is connected by road with nearby Quetta city. Pishīn district is located north of Quetta district and fronts Afghanistan on the east and northeast. It comprises a series of long valleys 4,500–5,500 ft (1,370–1,680 m) above sea level enclosed by the Toba Kākar Range to the north; vegetation is sparse. The district is drained by the Pishīn Lora River and its tributaries. Crops grown in the valleys include wheat, barley, corn (maize), and potatoes; grapes, apples, apricots, and peaches are also economically important. Sheep and goats are herded. The main ethnic groups are Pashtun Kākaṛ and Tarīn. Wool, carpets, and sheepskin coats are locally produced; coal is mined. 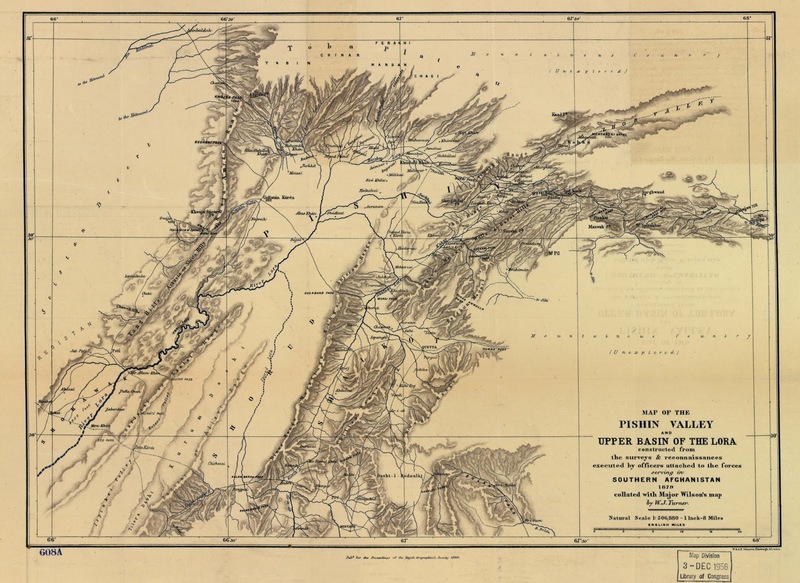 A major road and railway (completed 1888) connect Quetta city with Chaman, a commercial town, near the Afghanistan border. The railway runs through the Khojak tunnel (6,398 ft above sea level) in the Toba Kākar Range; it is one of the largest tunnels, with a length of 2.4 mi (3.9 km), in southern Asia. Pop. (1998) town, 20,479. The Dori, also called Lora and Kadanai is a river of Afghanistan and Pakistan. It is a tributary of the Arghandab River and sub tributary of the Helmand River and runs for 320 kilometres (200 mi) through Kandahar Province in Afghanistan and Balochistan in Pakistan. Harīrūd, in full Rūdkhāneh-ye Harīrūd, Turkmen Tejen, Latin Arius, river, Central Asia. It rises on the western slopes of the rugged Selseleh-ye Kūh-e Bābā range, an outlier of the Hindu Kush mountains, in central Afghanistan. Flowing west past Chaghcharān and the ancient city of Herāt (whence its name is derived), then north, it forms sections of the Afghan–Iranian and Iranian–Turkmen frontiers. After crossing into Turkmenistan, where it is called the Tejen, the river disappears into the wastes of the Karakum Desert. The Harīrūd irrigates some of Afghanistan’s productive, cultivated land. Its estimated length is 700 miles (1,100 km). The Baba Mountain range (Pashto: بابا غر‎ Bâbâ Ǧar; Persian: کوه بابا‎ Koh-e Bâbâ) is the western extension of the Hindu Kush, and the origin of Afghanistan's Kabul, Helmand, Arghandab and the Hari rivers. The mountain range is crowned by Foladi peak (Shah Fuladi, 34°38′43″N 67°37′27″E) rising 4951 m; 16,244 ft. above sea level, and is located south of Bamyan, Afghanistan.